This post is sponsored by Hallmark Signature, makers of greeting cards that help express your personal style. What is it exactly about handwritten cards and notes and letters that make them so very special to us? Have you ever thought about the nature of the whole process – the writing, the sending, the reading – and how it nurtures our relationships in ways that texts and emails and message notifications cannot replicate? Whenever I get a handwritten card in the mail I tend to consider these things. Like, is it the penmanship itself, and how with each swoop of the loopy letters and the carefully placed dots along the strings of “i’s” and “j’s” that make us feel something more than a message behind tapping keys and computers screens? You bet. Seeing someone else’s writing is beautiful. 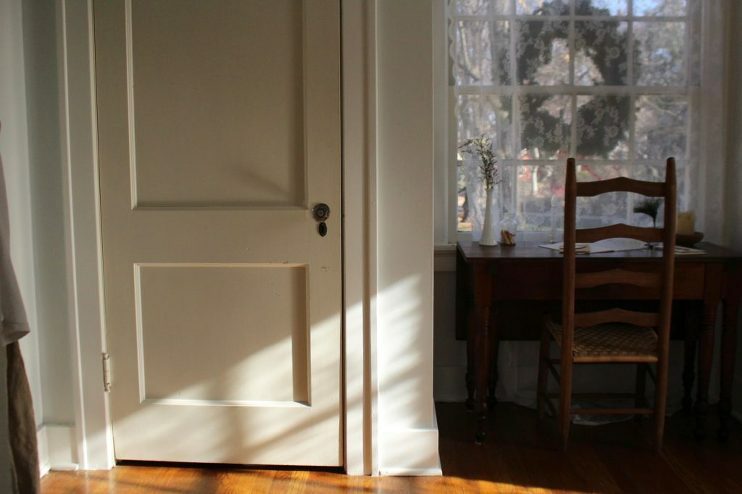 Is it the timelessness that this heartfelt tradition embodies? I absolutely think so. Writing with a pen and reading scribbled ink on paper is as simple as it comes, yet it’s also incredibly personal. Is it the unique invitation that handwritten cards give us, to simply stand still and slow down, so we can hear our thoughts outside of the fray of daily distractions and better connect with others? Yes. A hundred times, yes. 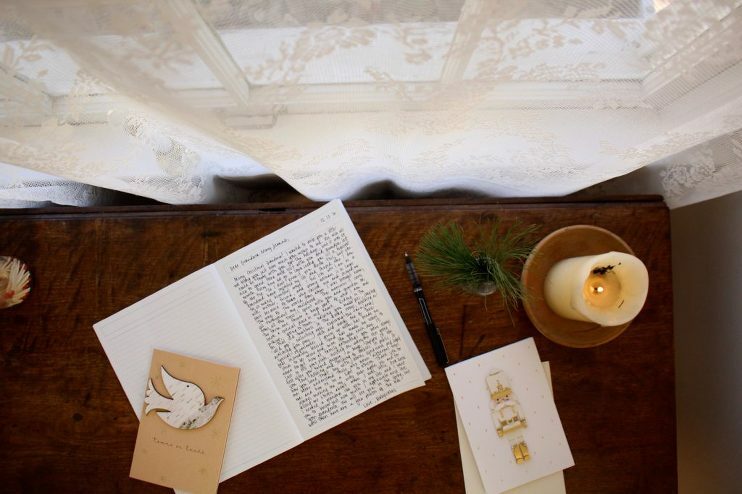 For all these reasons and more, writing and receiving handwritten cards and letters is wonderful. While I think any kind of meaningful note sent off to someone dear is wonderful and better than nothing sent at all, I will forever cherish ones done so with pen in hand. I have partnered up with Hallmark Signature to share with you how I plan to incorporate the beautiful art of sending intentional, handwritten cards this season to two of the most important woman in my life: my beautiful grandmothers. Whenever I experience this overt kind of encounter with time, it rattles and pushes me into a place of discomfort. Though uncomfortable, I have found this is a good thing, as most learning and growing experiences are. It has made our trips to Iowa and my phone calls home so much more meaningful because of the newfound awareness I have concerning time and its close connection with those who raised me. I have learned this year, that it is important for me see and hear and feel with tender clarity, the physical affects time has on our minds and bodies, and what a gift it is to connect with those who do not have much of it left. For this season and my hope for the ones following, I’ve chosen to send cards and write letters to each of my grandmothers telling each on paper exactly how thankful I am for their presence in my life. Because we cannot be there to celebrate this holiday in person, it’s important to me that I do something beyond sending a family photo of us five for them to hang on their fridge. I want to tell them personally how they as strong, compassionate women have helped shaped me into the woman I am today. I am going to share anecdotes of my childhood that stand out, stories that have shaped me, and recount times spent in their homes and on their laps. I am sending their card with a handwritten letter tucked inside to each of my grandmothers and hope to do so continually thought the year to give them some love and light. I am not sure if they will be able to write back, but more so I just really hope my words offer them warmth and comfort in this season of their lives. Let me tell you a bit about them. For the majority of my childhood my grandma Mary Jeanne lived with my grandpa Donnie on a big farm in the middle of a rolling tapestry of cornfields. Their home on Frozen Hill Road was my magical playground. It’s where I felt most free, most creative, and most understood as a child. My grandma was an integral part of me feeling so connected and content there, her energy and that special place is very much a part of me today. She taught me so many useful things over the years when I visited her and my grandpa in the summertime or on Christmas holiday. She always baked me an apple pie with extra sugar on top made with fruit from their trees and loved telling me stories of when I was a little girl when we made our way to town for groceries. Every night she’d help me make a comfy bed on the living room floor in their farmhouse so I’d be close by when the farmers would stroll in, usually unannounced, for a long, lingering breakfast before hauling back to their pickups with full bellies for their afternoon chores. I was always amazed how someone could just waltz in like that without calling beforehand. Farm living is not city living. Alas, my grandma always welcomed everyone who showed up for conversation and a meal and made them feel right at home. Sometimes on those mornings I’d wake up early with the sun and see her sitting there in her rocker, eyes closed, praying. My grandma Mary Jeanne is the most spiritual person I know, and the woman who has taught me how beautiful those who are different from us are. She has a special place in her heart for chubby babies, those with down syndrome, and the poor. She’s a woman of simple needs, and to this day, puts everyone else before herself. 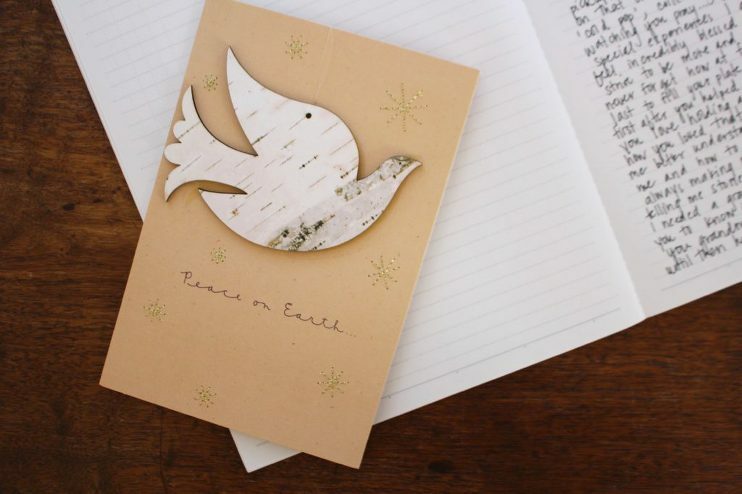 As a woman who truly embodies peace on earth, I chose the dove ornament card for her. My grandma Vivian and grandpa John lived in the same town I grew up in about ten minutes away. Their home was, and still is, full of rosaries, trinkets, floral prints, vintage items from the 70’s, and of pictures of Jesus. No wall is left untouched nor bare, as my grandma takes great pride in decorating and making things look just so. I will always remember how she always made me a Shaklee vitamin milkshake after school and let me play dress up in her pretties. I remember taking her rings and putting them on all of my fingers and pretending I was a princess who lived in a faraway land. Her necklace collection is a stunning one and she always had the best clothes for pretend play. My grandma Vivian is the most religious person I know. She is an extremely devoted Catholic, who ever since I was very small has invited the homeless to our meals for the holidays. I have memories of sitting around the table with those who had no table of their own, not members of our family but they were always treated as if they were. She always invited them into our quirky family traditions and gave each a warm meal made with love from her kitchen. My grandma Viv is a resourceful woman like her mother before her, never wasting a thing or skipping a beat. She collects toy giraffes, knits dolls for the poor, and has been wearing her makeup the same way ever since I’ve known her. To this day she is one of the most quirky, energetic, and thoughtful people I know. My memories of her always end in a smile and I will forever consider her extraordinary. As a woman who radiates joy and who is lover of all things that glitter, I chose the sparkly nutcracker for her card. Do you plan on sending any handwritten love this season? Perhaps you already have a tradition in place to do so. If not, I encourage you to sit down and send a handwritten card to someone who helped you grow this year. Christmas is a mere seven days away and it’s not too late to grab Signature cards for the extraordinary ones in your life. Click HERE to find a Hallmark Signature store near you. This post is sponsored by Hallmark Signature however all words, opinions, and photography are my own. I thank you dear reader for supporting me, along with the brands that help support this space and make Homesong possible.